It’s cold outside. But this will keep you warm. Made from store cupboard ingredients, it can be ready in 30 mins and warmed me and the boy perfectly this evening. Begin by sautéing the onion, carrots, parsnip and swede in the oil till the onions are translucent. Add the lentils, garlic, ginger and curry paste and cook out for 2-3 mins. 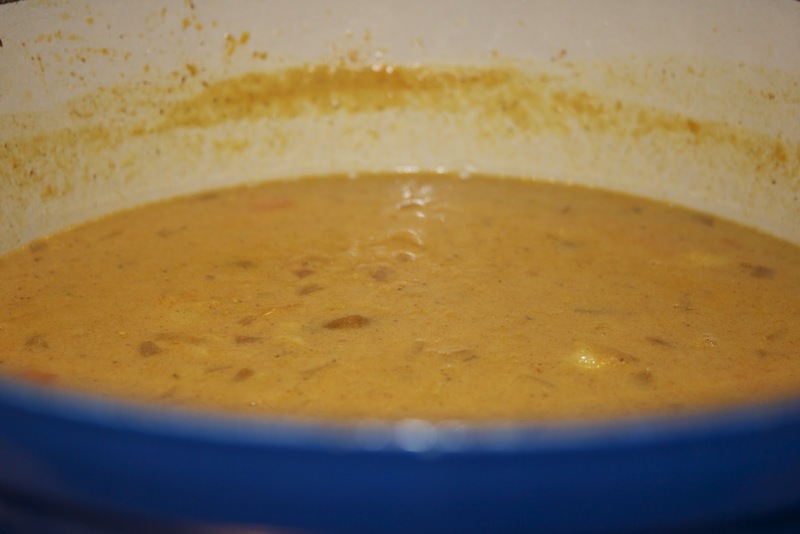 Pour over the water and coconut milk and bring to the boil, adding the stock powder and seasoning with black pepper. Simmer for 15 mins or so, until the lentils are cooked through and the vegetables are tender. Serve topped with roughly chopped coriander and mint and some naan bread. Bung everything into the slow cooker and leave on low for 8-10 hours. Eat. Sigh. Feel happy. Hea the oil and sauté the vegetables in a pan, covered with a lid, for about 10 mins. Add everything else, aside from the butter and flour, and cook for 15 mins or so till the vegetables are tender. Mix the flour with the butter to make a buerre marnie and mix in to the stew. Allow to thicken and then serve with mashed potatoes. Lovely. This was my second attempt with a slow cooker and from it I learnt that potatoes do not love a slow cooker, and lentils should be placed at the bottom of the crock pot. You have been warned. Begin by frying off the onion and celery in a pan. Place everything in the crock pot, starting with the barley and lentils and then adding the vegetables. Sprinkle over the herbs and add the stock. Leave on low for 8-10 hours. My FIL made this for us tonight and it was delicious, if a tad out of kilter with the seasons! Even Lex had two bowlfulls! Begin by sauteeing the onion, garlic and leek in a little olive oil. Then add everything else aside from the mushrooms. Bring to the boil and simmer for 20 mins or so until the green lentil are cooked. Meanwhile sautee the mushrooms and then add to the stew once everything is cooked. Serve with plenty of fresh crusty bread. Yum.